The Crossing of the Red Sea (Hebrew: קריעת ים סוף Kriat Yam Suph – Crossing of the Red Sea or Sea of Reeds) is part of the biblical narrative of the Exodus, the escape of the Israelites, led by Moses, from the pursuing Egyptians in the Book of Exodus. Moses holds out his staff and the Red Sea is parted by God. The Israelites walk on the dry ground and cross the sea, followed by the Egyptian army. Once the Israelites have safely crossed Moses lifts his arms again, the sea closes, and the Egyptians are drowned. God chooses Moses to lead the Israelites out of slavery in Egypt and into the land of Canaan, which God has promised to them. The Egyptian pharaoh, who previously said the opposite, agrees to let them go, and they travel from Ramesses to Succoth and then to Etham on the edge of the desert, led by a pillar of cloud by day and a pillar of fire by night. There God tells Moses to turn back and camp by the sea at Pi-hahiroth, between Migdol and the sea, directly opposite Baal-zephon. God causes the pharaoh to pursue the Israelites with chariots, and he overtakes them at Pi-hahiroth. When the Israelites see the Egyptian army they are afraid, but the pillar of fire and the cloud separates the Israelites and the Egyptians. At God's command, Moses holds his staff out over the water, and throughout the night a strong east wind divides the sea, and the Israelites pass through with a wall of water on either side. The Egyptians pursue, but at daybreak God clogs their chariot-wheels and throws them into a panic, and with the return of the water, the pharaoh and his entire army are destroyed. When the Israelites see the power of God, they put their faith in God and in Moses, and sing a song of praise to the Lord for the crossing of the sea and the destruction of their enemies. (This song, at Exodus 15, is called the Song of the Sea). The narrative contains at least three and possibly four layers. In the first layer (the oldest), God blows the sea back with a strong east wind, allowing the Israelites to cross on dry land; in the second, Moses stretches out his hand and the waters part in two walls; in the third, God clogs the chariot wheels of the Egyptians and they flee (in this version the Egyptians do not even enter the water); and in the fourth, the Song of the Sea, God casts the Egyptians into tehomot, the oceanic depths or mythical abyss. The Israelites' first journey is from Ramesses to Succoth. Ramesses is generally identified with modern Qantir, the site of the 19th dynasty capital Per-Ramesses, and Succoth with Tell el-Maskhuta in Wadi Tumilat, the biblical Land of Goshen. From Sukkoth, the Israelites travel to Etham "on the edge of the desert", then turn back to Pi-hahiroth, located between Migdol and the sea and directly opposite Baal Zephon. None of these have been identified with certainty. One theory with a wide following is that they refer collectively to the region of Lake Timsah, a salt lake north of the Gulf of Suez, and the nearest large body of water after Wadi Tumilat. Lake Timsah was connected to Pithom in Gesem at various times by a canal, and a late 1st millennium text refers to Migdol Baal Zephon as a fort on the canal. The Hebrew term for the place of the crossing is "Yam Suph". Although this has traditionally been thought to refer to the salt water inlet located between Africa and the Arabian peninsula, known in English as the Red Sea, this is a mistranslation from the Greek Septuagint, and Hebrew suph never means "red" but rather "reeds". (While it is not relevant to the identification of the body of water, suph also puns on the Hebrew suphah ("storm") and soph ("end"), referring to the events of the Exodus). 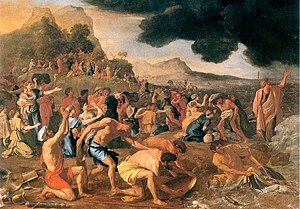 General scholarly opinion is that the Exodus story combines a number of traditions, one of them at the "Reed Sea" (Lake Timsah, with the Egyptians defeated when the wheels of their chariots become clogged) and another at the far deeper Red Sea, allowing the more dramatic telling of events. Reeds tolerant of salt water flourish in the shallow string of lakes extending from Suez north to the Mediterranean Sea. Kenneth Kitchen and James Hoffmeier state that these reedy lakes and marshes along the isthmus of Suez are acceptable locations for yam suf. The ancient yam suf is not confined to the modern Red Sea. Hoffmeier equates yam suf with the Egyptian term pa-tjufy (also written p3 twfy) from the Ramsside period, which refers to lakes in the eastern Nile delta. He also describes references to p3 twfy in the context of the Island of Amun, thought to be modern Tell el-Balamun. Tell el-Balamun was the most northerly city of Pharaonic Egypt about 29 km southwest of Damietta, located at 31.2586 North, 31.5714 East. No archaeological, scholarly verified evidence has been found that confirms the crossing of the Red Sea ever took place. Zahi Hawass, an Egyptian archaeologist and formerly Egypt's Minister of State for Antiquities Affairs, reflected scholarly consensus when he said of the Exodus story, which is the biblical account of the Israelites’ flight from Egypt and subsequent 40 years of wandering the desert in search of the Promised Land: "Really, it’s a myth... Sometimes as archaeologists we have to say that never happened because there is no historical evidence." Given the lack of evidence for the Biblical account, some researchers have searched for explanations as to what may have inspired the Biblical authors. For example, some have claimed that the parting of the Red Sea and the Biblical plagues were natural events caused by a single natural disaster, a huge volcanic eruption on the Greek island of Santorini in the 16th century BC. Carl Drews, a self-described devout Christian and researcher at the National Center for Atmospheric Research in the United States, has suggested that the Biblical Red Sea crossing "reflect[s] a real historical occurrence," namely, a natural phenomenon known as a wind setdown that has been observed to affect bodies of water. He conjectures that such a phenomenon could have created a land path through the Eastern Nile Delta (but not the Red Sea). His 2010 paper on the subject, co-authored with Weiqing Han and published in the journal PLoS ONE, treats the Biblical account of the Red Sea crossing as "an interesting and ancient story of uncertain origin." James Hoffmeier, an archeologist and faculty member at Trinity Evangelical Divinity School, deemed the wind setdown hypothesis "plausible," arguing that the Bible story should be seen as historical. 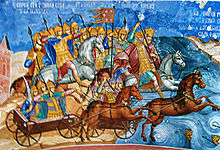 The theme of Moses crossing the Red Sea was taken up by the panegyrists of Constantine the Great and applied to the battle of the Milvian Bridge (312). The theme enjoyed a vogue during the fourth century on carved sarcophagi: at least twenty-nine have survived in full or in fragments. Eusebius of Caesarea cast Maxentius, drowned in the Tiber, in the role of Pharaoh, both in his Ecclesiastical History and in his eulogistic Life of Constantine. ^ Seiglie, Mario (3 June 1997). "The Bible and Archaeology: The Red Sea or the Reed Sea?". The Good News. United Church of God. Archived from the original on 15 August 2017. ^ Van Seters, John (1997). "The Geography of Exodus". In Silberman, Neil Ash (ed.). The Land that I Will Show You. Sheffield Academic Press. p. 270. ISBN 978-1850756507 – via Google Books. ^ Van Seters, John (1997). "The Geography of Exodus". In Silberman, Neil Ash (ed.). The Land that I Will Show You. Sheffield Academic Press. p. 273. ISBN 978-1850756507 – via Google Books. ^ a b Gmirkin, Russell (15 May 2006). Berossus and Genesis, Manetho and Exodus: Hellenistic Histories and the Date of the Pentateuch. Bloomsbury Publishing USA. ISBN 978-0567025920. Retrieved 27 October 2016 – via Google Books. ^ a b Kitchen, Kenneth A. (2003). On the Reliability of the Old Testament. Wm. B. Eerdmans. pp. 261–63. ISBN 978-0802849601. ^ Hoffmeier, James Karl (1999). Israel in Egypt: The Evidence for the Authenticity of the Exodus Tradition. Oxford: Oxford University Press. p. 214. ISBN 978-0-19-513088-1. OCLC 47007891 – via Google Books. ^ Hoffmeier, James K. (2005). Ancient Israel in Sinai: The Evidence for the Authenticity of the Wilderness Tradition. Oxford University Press. pp. 81–85. ISBN 978-0195155464. ^ Hoffmeier, James K. (2008). The Archaeology of the Bible. Lion Hudson. p. 54. ISBN 978-0825461996. ^ Hoffmeier, James K. (2005). Ancient Israel in Sinai: The Evidence for the Authenticity of the Wilderness Tradition. Oxford University Press. p. 86. ISBN 978-0195155464. ^ AJ Spencer (2009), Excavations at Tell el-Balamun 2003-2008, British Museum. ^ "Tell el-Balamun: A City of the Nile Delta of Egypt". The British Museum. Retrieved 22 October 2012. ^ Slackman, Michael (3 April 2007). "Did the Red Sea Part? No Evidence, Archaeologists Say". The New York Times. Retrieved 27 October 2016. ^ Correspondent, Jonathan Petre, Religion (2002-11-11). "Biblical plagues and parting of Red Sea 'caused by volcano'". ISSN 0307-1235. Retrieved 2018-08-18. ^ Drews, Carl; Han, Weiqing (3 April 2007). "No, really: There is a scientific explanation for the parting of the Red Sea in Exodus". The Washington Post. Retrieved 21 May 2017. ^ Drews, Carl; Han, Weiqing. "Dynamics of Wind Setdown at Suez and the Eastern Nile Delta". NCAR/UCAR OpenSky. PLoS ONE. Retrieved 25 March 2019. ^ Mooney, Chris (21 September 2010). "Parting the Waters: Computer Modeling Applies Physics to Red Sea Escape Route". National Center for Atmospheric Research. Retrieved 24 May 2017. ^ Paul Stephenson, Constantine, Roman Emperor, Christian victor, 2010:209f. ^ Eusebius, HE ix.9, Vita Constantini i.38. Wikimedia Commons has media related to Crossing of Red Sea.